Madoka Magica is an award winning anime series, famous for deconstructing the "magical girl" anime genre and turning it into something more akin to a psychological thriller. More than that though, the series is beautiful, mixing several disparate art styles to make an anime unlike any other. This past weekend, the series' first movie, Puella Magi Madoka Magica the Movie Part 1: Beginnings, was released in theaters across Japan. But far from being a simple rehash of the first half of the anime series, this film actually manages to surpass its source material. Let's get the bad out of the way right at the start. 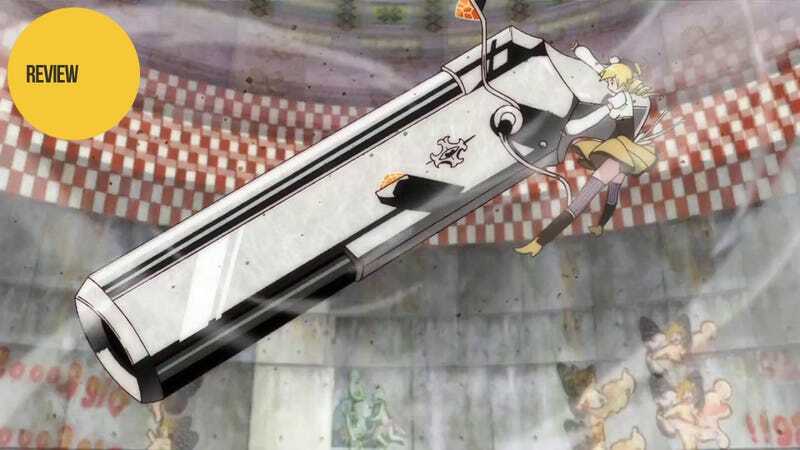 Madoka Magica: Beginnings is about 95% shot for shot, scene for scene, line for line the same as the TV series. There may be a grand total of thirty seconds of completely new footage in the entire movie. Moreover, the vast majority was indistinguishable in quality from the Blu-ray release of the series, meaning little to no touch ups were done to the film. However, that's not to say there weren't a few visual improvements in the form of additional magical effects, new backgrounds, and transformations sequences. series took two hours and forty minutes to cover the same events, leaving about thirty minutes on the cutting room floor. This is in no way a bad thing. If the TV series had one problem, it was that it spent too much time discussing and re-discussing the same information—i.e., what is your wish going to be—over and over with little to nothing new in each iteration. Many of these, along with exposition scenes (i.e., how telepathy works) and silliness not related to the overall story (i.e., hiding their adventures from their friends and families), are simply cut from the film. The abridgment also serves to make Homura's power far more mysterious as the clock motif (sans her room) and close-ups on her shield are completely cut from the film. The only major—and questionable—cut was the opening dream sequence from the first episode which foreshadows not only the climax but also the driving secrets of the plot. This seems like a rather major part to leave out, but we'll find out next week when the second film comes out whether it means anything or not. all the plot twists and character motivations, it almost becomes a new story—not about Madoka but about Homura. Suddenly the story can be looked at as Homura being the only sane person in an insane world—and the only one who really has a clue about what's really going on. Moreover, many of her lines have double meanings that can only be appreciated upon a second viewing. Going in to Madoka Magica: Beginnings, I was sure that there would be nothing new in the film—that it'd just be a useless cash-in. Yet, almost against my will I was drawn back into the story. The movie was perfectly paced—more so than in the anime—and an astounding amount of content kept the story interesting for the full two hours and ten minutes. To say I am looking forward to the second movie, Puella Magi Madoka Magica the Movie Part 2: Eternal is an understatement. Luckily, I only have to wait until next weekend to see it. Puella Magi Madoka Magica the Movie Part 1: Beginnings was released in Japanese theaters on October 6, 2012. It will be premiering in several major cities across the United States starting October 19, 2012.